Have you ever heard of “hair plopping?” I certainly never did until now. It sounds weird, but it is actually a genius (and really easy) technique to make curly hair curlier.My curls are very, very loose. They are so loose in fact that they are more like waves most days. I have tried a million different techniques to try and get big curls (like this method that doesn’t require a curling iron). But most of them just take way too long, and I prefer quick hairstyles like these. Well, “hair plopping” fits the bill on both counts. 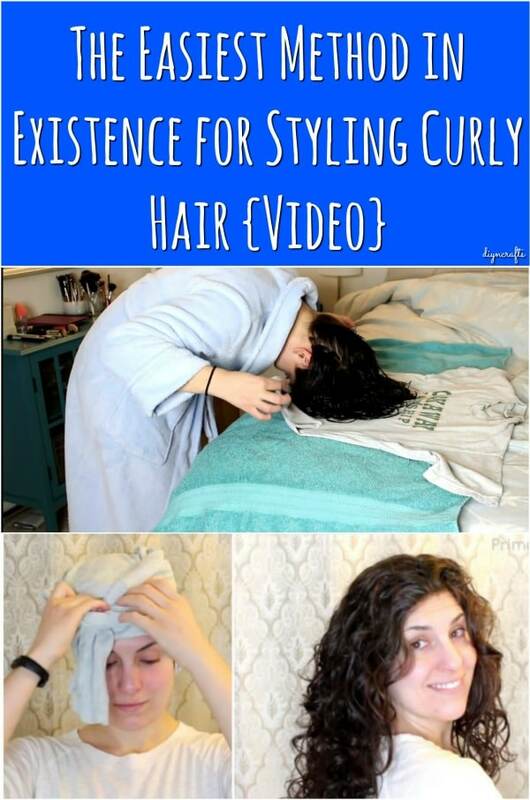 You have to leave your hair up in a T-shirt overnight, but it only takes a few minutes to actually get your hair ready. As you can see, it is ridiculously easy! And I can’t get over how gorgeous her hair looks when she pulls it out of the t-shirt the next morning. I have tried this a few times already, and I have been getting pretty good results. They aren’t as dramatic as hers, but I don’t have all the styling products she does. So your results will vary depending on what you have available to use. I also should tell you that if your hair is really long or thick, it may not dry completely overnight when it is wrapped up like that. My hair is a little damp the next morning, but it dries out quickly after I pull it down. I really am super impressed by this technique. Give it a try — I think you’ll get awesome results!